To ensure good health, a variety of nutritious food items shoud be available to your macaw. 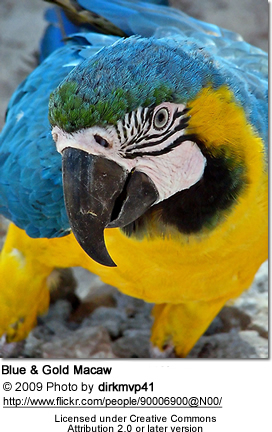 Typically, a core diet of an organic and color-free parrot pellets and / or high-quality dry bird mix. Pellets: In the 90s, pellets were recommended by just about everyone; however, concerns have been raised about poorly balanced processed pellets and harmful additives. Still, many vets recommend one particular pelleted diet: Harrison's - which is mostly available at the vets' offices.When discussing pellets with my vet, he felt that most people just don't offer a sufficiently varied diet and providing formulated diets, such as Harrison's, is better than risking a one-sided nutrition ...Looking over the ingredients, Harrison's most certainly is superior to most other pelleted diets on the market. Please note: When feeding pellets to your pet, please be aware of the fact that overly feeding citrus fruits (including oranges) or vitamin-C-rich foods to your birds can lead to "Iron Overload Disease" as vitamin C increases the amount of iron absorbed from foods and supplements. Base Diet Mix: Not all parrots can be pursuaded to consume pellets and many bird owners, including myself - generally don't like to feed pellets. Please note: Seeds should be fed in moderation, and the seeds should always be clean and fresh. In general macaws require a higher fat content in their diet which can be provided with some of the large nuts as a part of their regular diet. A large variety of fresh fruits and vegetables should be provided for both nutrition and mental stimulation. Dry Fruits / Veggies: When fresh fruits and vegetables are not available, dehydrated fruits and vegetables work wonderfully. Many birds love their crunchiness, or they toss them into their water dish (creating a "soup" of some sorts) and then eat them once they are rehydrated. Be prepared to change the water more often throughout the day. Dried fruits and vegetables have the advantage that they don't go off. You could literally leave them in their cages for days (unless they get wet, of course). This surely comes in handy when traveling. Dried fruits and veggies also help convert "seed junkies" to a healthier diet. When you are at home, you can moisten the dried fruits and veggies with warm water to rehydrate them. Birds tend to LOVE warm fruits and veggies, maybe because it gives them flashbacks to the times when they were chicks and were fed warm regurgitated food by their bird parents. An inexpensive and convenient way of feeding living foods / greens to your macaws would be sprouted seeds. Even if you don't have time to prepare vegetables, spooning out some sprouted seeds for them is easy and quick. The best thing, however, is that sprouted seeds are extremely nutritious and I have not seen a parrot yet who didn't love them. Sprouted seeds are a good way of introducing greens to the stubborn eater. Don't want to go through the trouble of sprouting and would prefer an easier way to provide greens to your bird? You can also germinate the sprouting mix - rather than going through the process of sprouting, which may be somewhat intimidating initially. Germinated seeds offer its own unique set of valuable nutrition and are quicker to obtain and less likely to spoil.